When a company plans a seminar or event, registered participants are often sent emails a month/week/day before the actual date. These are for word-of-mouth marketing ("Don't forget to come," "Tell your friends," "Bring your friends," etc.) as well as simple reminders ("This is what we'll be doing," "Here's the agenda," "Here are some helpful links," etc.). The number and content of these emails depend on each company's methods, and they will inevitably differ according to involved products and services. We already introduced examples with open houses and test drive events: "Sending Reminder Emails Without Fail" and "How to Monitor the Occurrence of Irregular Cases." The usages of swimlanes are not clear-cut, even in the BPMN standard. 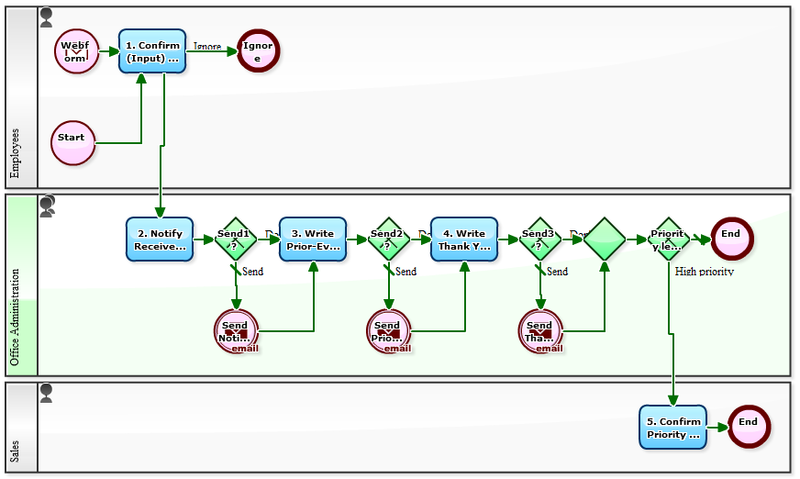 Many business process management systems (BPMS), including Questetra BPM Suite, use a rule that says the person who operates the first task in a swimlane owns all following tasks in that swimlane. (Tasks are the rectangles with round corners. )This means that, in the above workflow, the person who sends the first message to the customer ("thank you for applying!") is in charge of sending all other messages, too ("The event's coming soon!" and "Thanks for participating!"). This rule is called "Retain Familiar" according to Workflow Patterns. 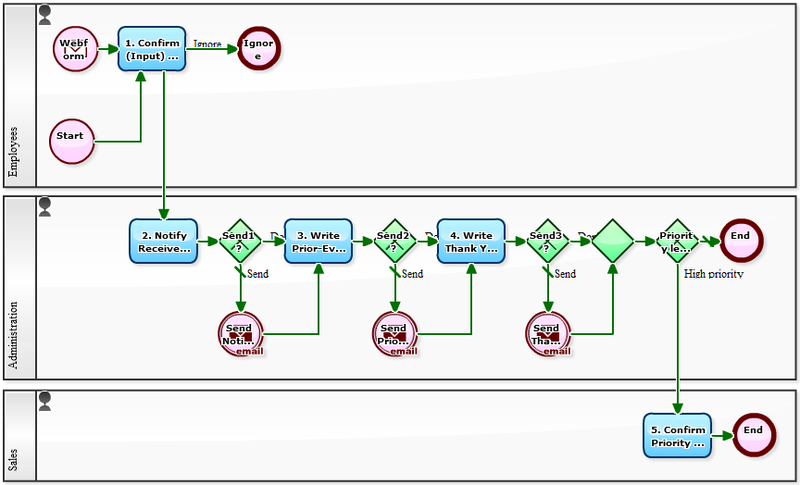 Of course, one option to make this more flexible is to offer each task to all team members every time, but in Questetra BPM Suite we have a convenient solution called "Team Swimlanes." These are special swimlanes that don't go through the step of deciding who owns each task. They are especially geared for jobs that several team members work on together, because each task will be allocated to all members at the same time. * Team swimlanes are particularly effective for defining workflows for a collection of ad hoc tasks (tasks that are difficult to know in advance who should be in charge of them).